All the Western Stars – Peachtree Publishing Company Inc. This memorable story is filled with universal fears and truths of two men chasing a hurrying sundown. 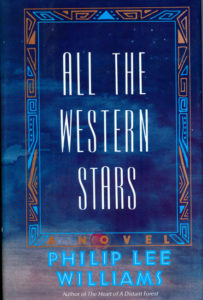 All the Western Stars is a memorable story, filled with universal fears and truths. A story of two men chasing a hurrying sundown. Jake Baker, a seventy-three-year-old former construction worker who walked the high steel, suddenly finds himself ill and relegated to an old folks’ home by his insensitive niece. There he regains his health and meets Lucas Kraft, the shell of a famous novelist and a former National Book Award winner, who is searching for the remnants of his talents and his life. These two men from vastly different backgrounds share a common bond—they’re both on the run. Running from their pasts, from their mortality, from the fear of dying unfulfilled. Jake and Lucas break out of the nursing home and head west. Like children, they want to be cowboys; like old men, the want to experience life, raw and thrilling, once more while they can. Lucas wants to find a range war where he can prove his manhood: “I will become part of legend, and they will write songs about me, how I rode in from the East and became one of them so fast, how I helped rid them of the evil robber barons from town.” Jake wants to prove that he’s still emotionally alive, and he finds that proof in the comforting arms of Betty Silver, a good-natured, foul-mouthed woman who is searching for her estranged daughter. As broad as the western sky and as warm as a Texas summer night, All the Western Stars will hold you as surely as barbed wire and as gently as a hug. Philip Lee Williams is the author of fourteen published books. He lives in Georgia. You can visit his website here.